In this page 'Addition formula questions' you can see questions involving addition of fractions. We have also given the solution for these problems.Students can try to solve them on their own. If you have any doubts in this problem you can see this solution to get clear idea. 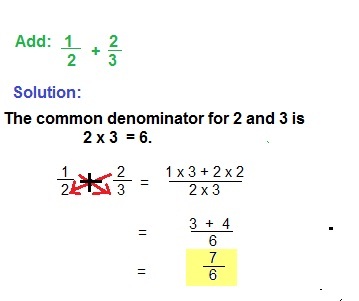 Adding two fractions are very easy if the denominators are same(like fractions). If the denominators are not same then we have to convert each fraction for the common denominator so that it will be easy for us to add the fractions. The following method shows how easily we can convert the given unlike fractions to like fractions. If we want to add two fractions with different denominators we need to take L.C.M for the two fractions and we need to change them as same.Then only we can add the numerators.But in our method we can easily apply the formula and no need worry about taking L.C.M for the denominators.This formula will be very useful to the students who are beginner to Math.By using this formula we can easily get answer for a difficult problem too.After applying this formula we need to simplify the final answer to get the simplified form.Any way this new method will be very useful to the beginners.We have also given examples for each problem to make you understand more clear.We hope this will be very helpful to the students who are facing difficulties in doing problems in math.We have also given worksheets for each category of topics. By practicing this worksheets you can get more knowledge.These are the most basic topics in math.Students must practice this kind of worksheets.The students who are in the elementary grade must practice this kinds of worksheets to get more knowledge in math. In this page you can get a clear idea in this topic and you have worksheets which consist of five question with clear steps has given. After solving these problems in 'Addition formula questions' Students can try the worksheets whose link had been given in 'solutions' page. Parents and teachers can encourage the students to do the problems on their own. If they find any difficulty they can compare their work with solutions. Once the students complete the worksheet they will master in 'fraction-addition'. If you have any doubt you can contact us through mail, we will help you to clear your doubts.